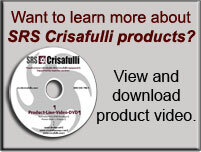 SRS Crisafulli's Integrated Product Solutions - To remove water, soft and abrasive material, sludges, and slurries from Industrial, Municipal, Agricultural, and Government Lagoons, Ponds, Lakes, Canals, and flooded and flood threatened areas. And to irrigate farms and ranches. Let our Application Engineers help you select the best product to achieve your dredging, pumping, or portable power goals. Phone 1-800-817-7011. Dredge Rentals. Many customers rent Crisafulli’s Rotomite and FLUMP dredges on short-term leases, and, after becoming familiar with the productive capabilities of the dredges, buy them. Dredge Installation and Training Services. 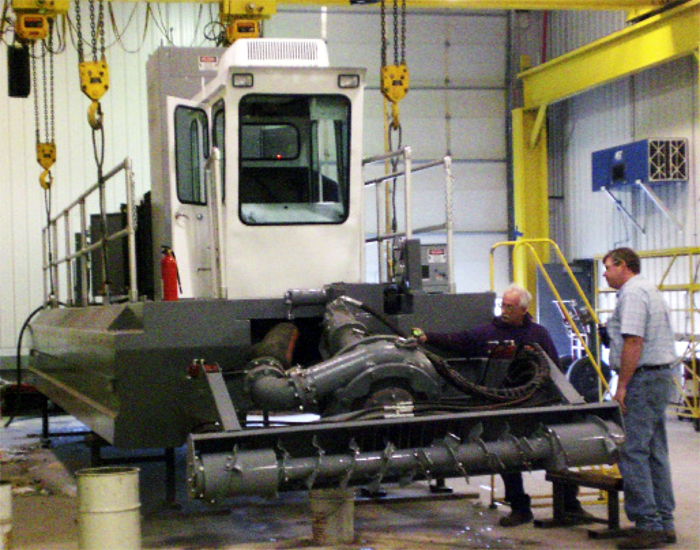 Crisafulli provides installation and training services for dredge customers across America and around the World. Return to SRS Crisafulli Case Histories and Testimomials. Go to Contact Us. SRS Crisafulli (“SRSC”) Designed and Built the self-propelled, steerable, diesel powered all purpose dredge for both abrasive and soft slurries with a cast alloy pump, and 6” pump discharge, in the fall of 2013. A copper mine in the American Southwest rented SRSC’s Rotomite-6000 CD (“R6CD”) to restore the mine’s basin capacity without stopping mine processes, an ideal application for hydraulic dredging. The customer’s plastic-lined tailings dam collects outflow from various processing facilities. The slurry is acidic, with lye added to balance ph levels. A floating pump transfers water and material from a small catch basin into a large permanent tailings impoundment pond. The limited ability of the customer’s floating pump to pull in slurry led to an undesirable build-up of solids, which reduced the tailings impoundment pond’s holding capacity. The customer wanted to restore the pond’s capacity to original levels without stopping mine processes or damaging the pond liner. The customer selected the R6CD for its ability to handle abrasive tailings materials. • Pumps Slurries. The R6CD was also able to pump slurries through 500 feet of 8-inch floating discharge pipe, 1,500 ft. of 10-inch fused pipe, and over an 80-foot berm at 1,300-1,500 gpm. • No booster pump. No booster pump was required, thereby reducing the system’s cost and complexity. • Liner Protection Cage on Cutterhead. The dredge cutterhead was outfitted with a liner protection cage, to prevent the dredge’s horizontal auger from damaging the pond liner as the auger pushed slurry into the dredge pump. • Cutterhead Articulation. Because the liner protection cage restricted the auger from digging into settled solids, SRS Crisafulli’s unique cutterhead articulation became indispensible as the primary method to break up compacted bottom material. • Hydraulic Thruster. The hydraulic powered thruster on the back of the Rotomite-6000-CD was also a critical component. • Self-Propulsion. Since both the perimeter and floor of the basin are irregularly shaped, and a fence surrounds the basin, cable positioning of the dredge would have been difficult and cumbersome. • Cutterhead Depth Control and Versatile Thruster. The thruster’s 180-degree range of motion and the hydraulically controlled variable cutterhead depth enabled quick and easy positioning of the dredge during operation and docking. The customer estimated 76,000 cubic yards of material had to be removed. A satisfactory quantity of tailings was removed to restore the impoundment’s capacity. Thanks to the SRS Crisafulli dredge rental program, and the immediate availability of the Rotomite-6000-CD, the copper mine’s project was completed in less than six months. The inaugural season of the Rotomite-6000-CDCD was a great success. 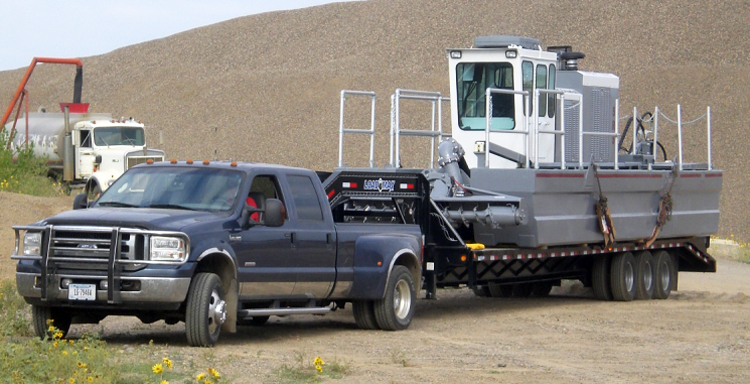 Easily portable on land, the Rotomite-6000-CD is shown on a lowboy towed by a Ford pickup truck.